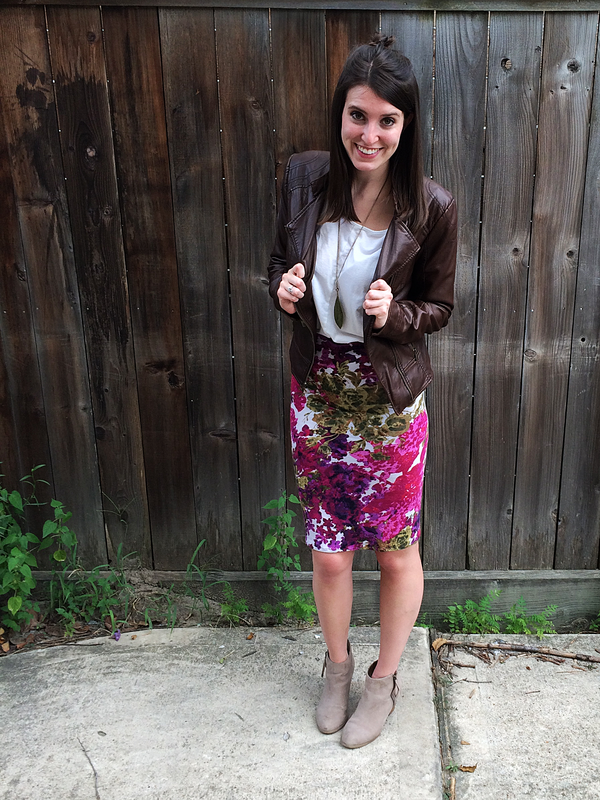 I’m always looking for pieces to add to my closet that can transition over multiple seasons. The trick is finding colors and patterns that aren’t too specific to one season. 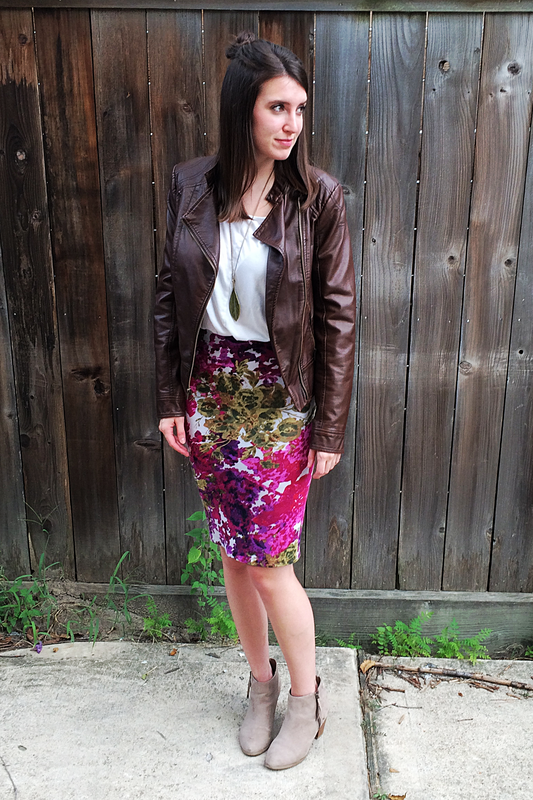 Although most floral prints are only appropriate for the Spring time, I found a great one at Joann’s that included darker purples and greens that work really well with the earthy tones that the Fall is known for. 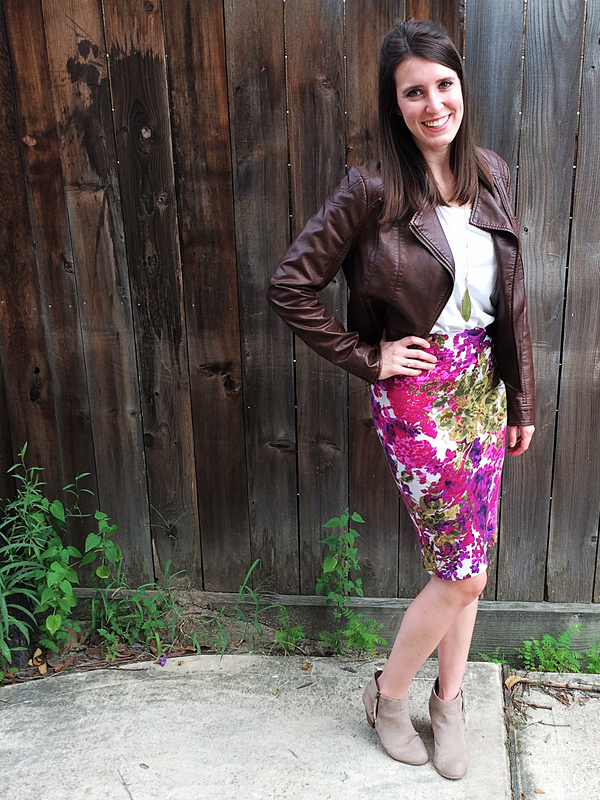 This Spring I threw this pencil skirt together with the leftover fabric from my floral fit and flare dress. Though I sported it from April through June with no problem, I rediscovered it again this last weekend. 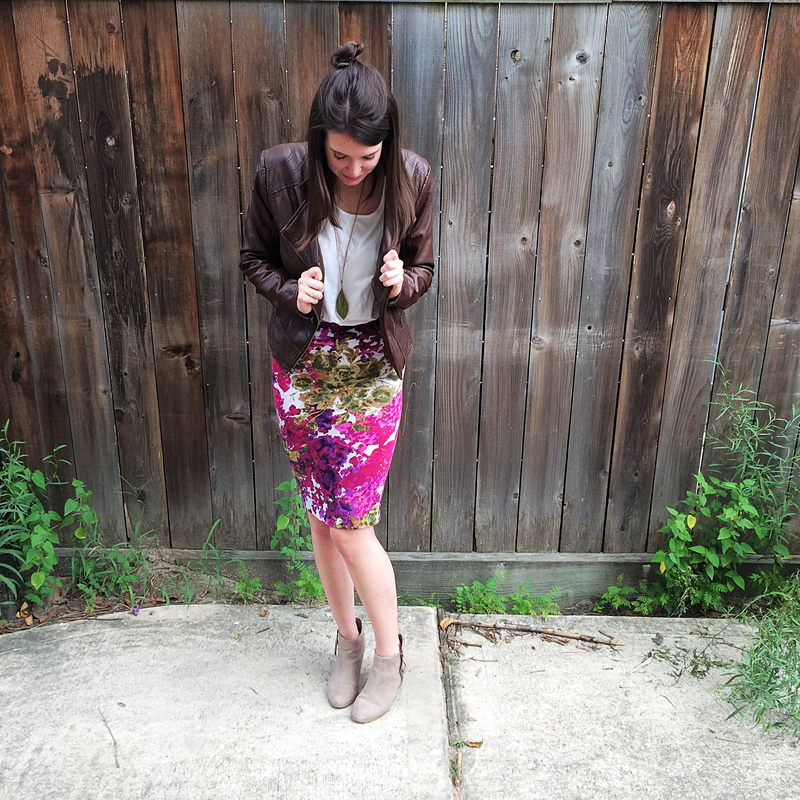 Pairing it with some booties and a leather jacket for cooler nights gave it a totally new look! 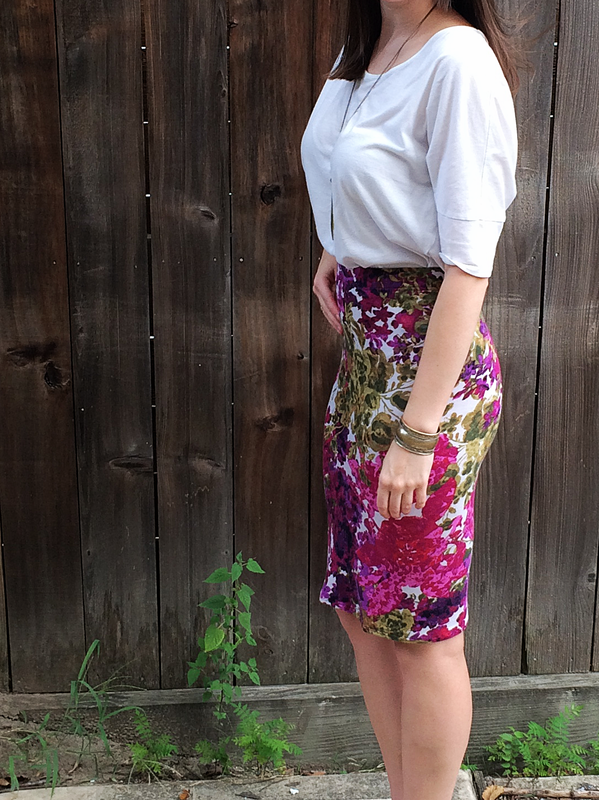 Since this fabric is so busy, a simple pencil skirt silhouette was an easy choice. 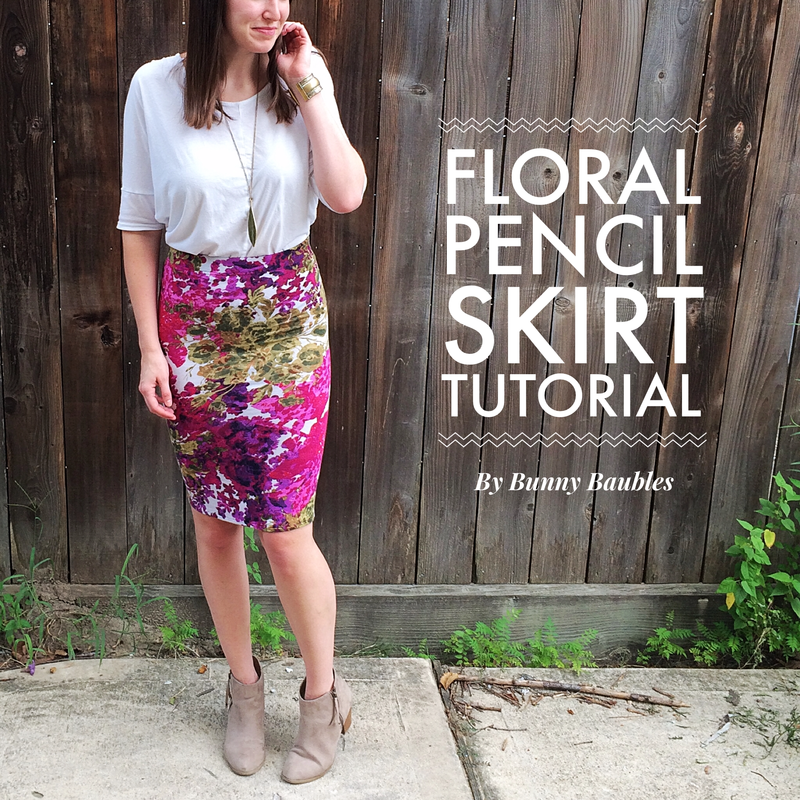 Not to mention, a pencil skirt in a stretch knit makes for an incredibly simple sewing project. 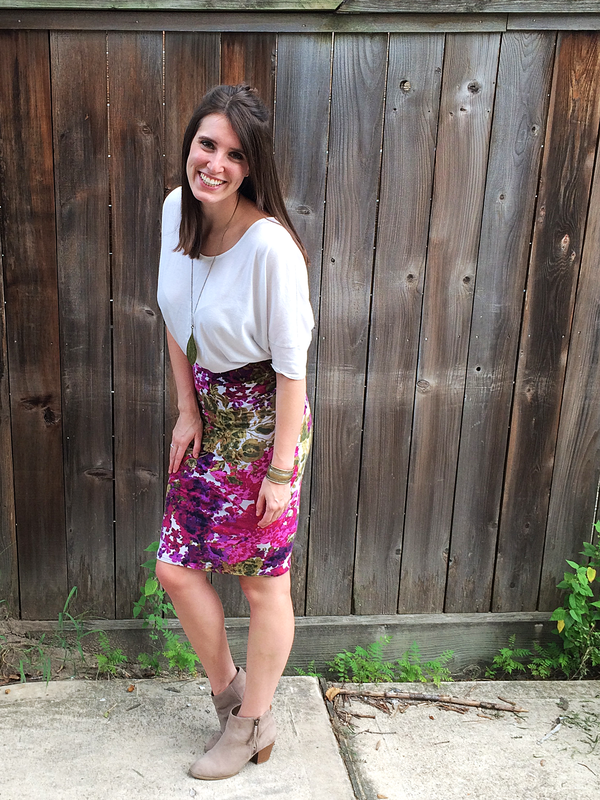 Just a rectangular piece of fabric, a piece of elastic, and an hour will have you looking fabulous! If you’re looking for a great beginner sewing project that will give you some confidence to try something a little more tricky, this is a great one to start with. It won’t take too long, and even if you totally mess up, the supplies are so cheap you can scrap them and try again! P.S. How do you guys feel about the half up top knot look that’s been going around this summer? I’ve fully embraced my love for it! There’s something childlike about it that puts me into a playful mood, and I think we could all use a little more of that in our lives. 1. Take your piece of elastic and pin it to the backside of your fabric lined up at the top. Grab your thread and machine and sew along the edge of the elastic about a 1/4″ from the edge of the fabric. 2. Fold the elastic and attached fabric down toward the backside of the fabric. You should now have completely covered the elastic in the fabric. Pin the elastic down and sew along the bottom edge of the elastic, about 1 3/4″ from the edge of the fabric. 3. 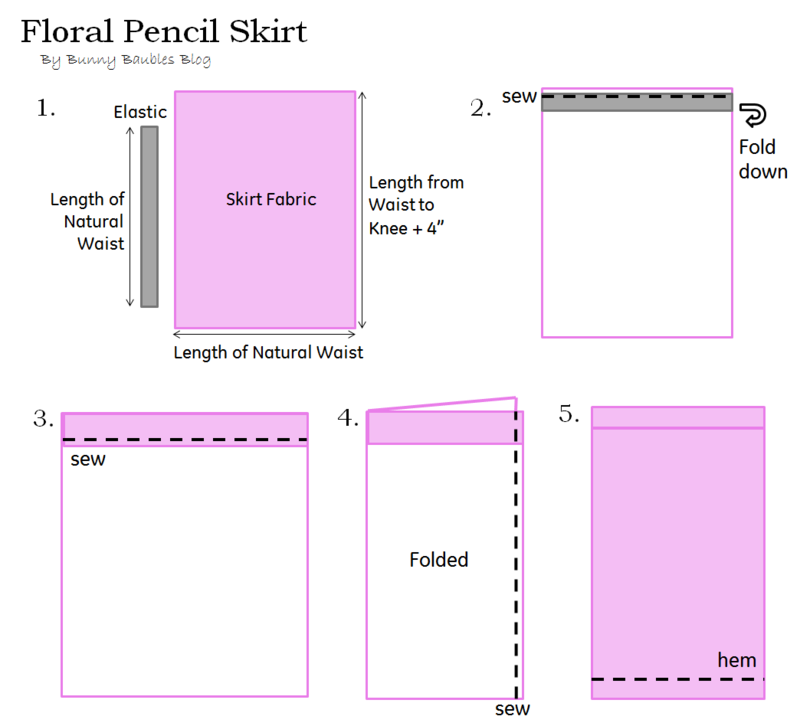 Fold the skirt in half so that the ends of the elastic meet and the backside of the fabric is facing out. Sew along the edge of the skirt from the elastic all the way down to the bottom hem about 1/4″ from the edge of the fabric. I sewed a zigzag stitch on the outside next to the straight stitch in order to really secure the seam (don’t want the skirt to split when you sit!). 4. 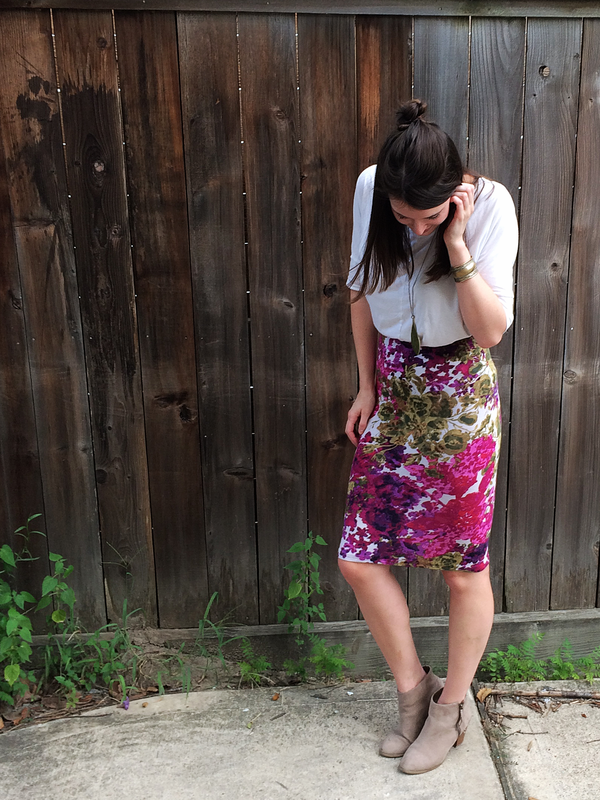 Try the skirt on inside out. Cut any excess fabric off the length if it’s more than 1/2″ and fold the hem up to the desired length and pin. Sew along the hem about a 1/4″ from the edge of the fabric. Turn the skirt right side out and you’re done! Yes! when you go ask someone where the stretch knits are. It’s like tee-shirt material but with extra stretch to it! Okay perfect! I pinned it already, I am going to try it out! Ah that’s the worst! Sometimes I have terrible luck, and other times I leave with a pile of fabric. I hope you find something!